Raj Bhakta, Republican candidate for the 13th District U.S. House of Representatives seat in Eastern Congress in Pennsylvania, recently took a trip to the US-Mexico border, and to demonstrate the lax security, took three elephants and a six-piece mariachi band across the Rio Grande. "To my surprise, the band played on, the elephants splashed away, and nobody showed up," Bhakta said. "The elephant never made landfall into Mexico, but I tell you something, he could have made 15 laps back and forth, but no one showed up," said Raj Peter Bhakta, a former star on the NBC show "The Apprentice." Three elephants, two African and an Asian, were taken out to a ranch near Boca Chica beach to perform. Bhakta was in Brownsville to raise funds with friends and decided to get a first-hand look at border security while he was here. In Brownsville, he witnessed half a dozen men swim under one of the international bridges "with complete immunity" which in turn prompted him to take the immigration issue to the next level. Bhakta decided to see if he could get an elephant accompanied by a six-piece mariachi band across the river. Bhakta favors supports a border fence, local law enforcement assistance with immigration laws and the use of the National Guard troops to help the U.S. Border Patrol. ARRA Stands with Values Voters - Please Go To the Polls and Vote! Don't surrender voting for the family values and traditional beliefs cherished by conservative value voters by staying home and not voting. We all have experienced real disappointment because of those who have gained access to the GOP who have defiled our traditional beliefs in traditional marriage and family. The ARRA stands with you! In Arkansas, we have good conservative candidates running for office against the liberal candidates that devalue our beliefs. These candidates need our votes! Cast your vote to save Arkansas this year - vote for the GOP candidates not because they are GOP candidates but because they are the candidates that most closely reflect our Arkansas values and beliefs! All Bob the Tomato wanted to say is, "God made you special and He loves you very much," but the censors at NBC are worried that Bob's love for God might offend some viewers. Was NBC unaware that Veggie Tales teaches Judeo-Christian values when they offered Big Idea a Saturday morning slot? They were fully aware that veggie hosts Bob the Tomato and Larry the Cucumber teach kids Bible stories that include Jesus' birth and resurrection, Moses in the basket, Gideon the warrior, and Queen Esther's courage. The stories always end with a Bible verse. Except on NBC. Rep. Bob Ney, R-Ohio, pleaded guilty Friday in the Jack Abramoff influence-peddling investigation, the first lawmaker to confess to crimes in an election-year scandal that has stained the Republican-controlled Congress and the Bush administration. Ney did not immediately resign from Congress, and within minutes, Republican and Democratic leaders vowed to expel him unless he steps down. The White House also called for Ney's resignation. On Thursday, Oct 12, big money Washington DC bureaucrat and corporate board member, Bill Halter met Jim Holt again for a second debate. While Halter smiled and never really gave an good explanation of his positions and where he has lived for the last several years, Holt continued to present his record of service for standing up for Arkansans. Halter kept trying identifying that Holt had been the odd man out in his votes instead of joining the majority. This worked to Holt's advantage since many of Holts past stances on issues for the people of Arkansas have become the current position of those who opposed Holt in the past. While Halter, backed by big out of state money, argued for a State Lottery and for numerous large government programs which will burden the taxpayers, Holt held his position that taxes are strangling Arkansans and preventing businesses outside the State from coming to Arkansas. Halter argued for more education (starting at age 3) and center of excellence at universities in hope more business would come to the state if we have more education. Holt detailed that Arkansas graduates are leaving the state in droves for jobs in neighboring states. Holt a product of Arkansas public education, military service, and years of working and public service in Arkansas is connected to the needs and beliefs of Arkansans. Bill Halter attended private elementary and secondary school in Arkansas and then left Arkansas to attend college in California and England. He did not return for 25 years until right before his decision to seek the Governor's office but withdrew from that race to seek the Lt Governor's office. Halter has the Clinton style, has no time experienced in the Arkansas education system and no experience living and working as an adult in Arkansas. Now funded with large amounts of outside cash, Halter asks the voters to trust his smile and promises for the future (big programs and higher taxes). Holt continues to stand firmly on the ground he has always stood fighting solely for Arkansans while remaining loyal to his moral beliefs and family. The question is whether the popular vote will be for the new liberal person with lots of out-of-state funding and the whimsical smile and voice saying trust me. However, the right choice is to vote for Jim Holt. On Wednesday evening, Oct 11, Jim Lagrone and Charlie Daniels squared off in the AETN sponsored debate. When a reporter question about Daniels putting his son and daughter-in-law on the Secretary of State payroll, Daniels, an astute old-time politician, stepped right up and said "yes, I did." He claimed his two family members were the two most qualified people he new and obviously didn't see why he should hire his family. Supposedly, he has numerous other relatives working on the state's payroll at the Capitol. His repeatedly when confronted said that things have gotten better and will continue to get better at the SOS office. We should all hope so. Jim Lagrone articulated the problems at the Secretary of State's office, specifically with the major Arkansas primary election problems in various counties including the disenfranchisement of many voters, especially military voters. When asked as a Baptist preacher if he was negatively campaigning, Lagrone pointed out that it is not negative to identify the major areas and examples of problems occuring under the direction of Daniels. Jim expressed his concern for the need to protect the rights of all legal voters. Obviously Daniels has name recognition and wishes to stay in office as long as possible. As former Arkansas Land Commissioner who was term limited but he didn't follow voter expectations of retiring to private life but instead moved on to SOS. It was noted that Daniels left a lot of unfinished work which his replacement quickly cleaned up. Jim Holt is the first viable candidate that Daniels has faced in years. Arkansas has a real opportunity to see significant improvements in the Secretary of State office including the stopping of the Daniels' nepotism policy by voting for Jim Lagrone for Secretary of State. 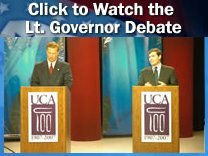 Tonight in an AETN sponsored candidate debate for Arkansas Attorney General, the Green Party candidate, Rebekah Kennedy, didn't beat around the bushes but clearly asserted that the present Attorney General Mike Beebe has not been doing his job protecting the citizens of Arkansas against fraud schemes. She identified that Beebe was willing to warn people about schemes after they occurred but that he was not proactive in stopping these schemes or in going after the sources of these predatory practices. This young left leaning Green party candidate focused on the proverbial "the emperor has no clothes" by identifying that Mike Beebe, candidate for Governor, has not been protecting Arkansans as Attorney General. This imagery continues to apply to other areas of his apparent lack of performance as Attorney General. On example has been his failure to deal with the hiring of illegal aliens in Arkansas. Although he has said, "there is a law on the books" that it is illegal for employers to hire illegal aliens. He also has not protected Arkansas taxpayer from deception by fraud by illegal aliens and their employers. Maybe his lack of past performance is the reason he could only suggest using a "bully pulpit" if elected Governor to address illegal aliens in Arkansas. Mike Beebe in his pursuit to be Governor continues to reveal that he has been too busy ("party-ing - doing things within the Little Rock beltway") to dress himself in responsible performance as Attorney General. Mike Beebe deserves the "Emperor has no clothes award" and not the position of Governor. Many of us know our Democrat Congressional Delegation (Berry, Snyder & Ross); at least, all of us know who they are. Most of us might find them to be nice fellows in spite of the fact that they have voted a majority of the time in opposition to the issues and values we hold dear as Arkansans. Nancy Pelosi (D, CA) will become the next Speaker of the House. She vote liberal 95% of the time. She voted against cutting taxes, against renewing the Patriot Act, against reducing the death tax, and against making it illegal to desecrate our flag. She supports gay marriage, has backed legislation to fund abortions for military women and military dependents, wants a timetable for withdrawing our troops from Iraq, supports gun control, and opposes strengthening the enforcement of immigration laws. She would be third in line to the Presidency, right behind the Vice President. Steny Hoyer (D, MD) would be the Majority Leader. All spending bills originate in the House. The first order of business will be to raise our taxes. Hoyer?s voting record virtually mirrors Pelosi?s, and he calls himself a ?tax-tax, spend-spend? Democrat. The Washington Post has called Hoyer one of ?the house?s 10 most prodigious suppliers of pork? spending. Barney Frank (D, MA) would chair Financial Services. Openly gay, Frank founded the national gay, lesbian, bisexual, and transgender Stonewall Democrats. Frank is all for gay marriage. When the Democrats last ran the House, Frank received a slap on the wrist when it was discovered that Frank?s boyfriend was running a male prostitution ring out of Frank?s apartment. John Conyers (D, MI) would chair the Judiciary Committee. He has impeaching President Bush on the brain along with slavery reparations. John Murtha (D, PA) would head up the Appropriations Committee?s Defense Subcommittee. He has been a leader of the cut-and-run crowd. Charles Rangel (D, NY), who equates tax cuts with racism, would become chair of the Ways and Means Committee which writes the tax bills. Expect your taxes to escalate dramatically and quickly. Alcee Hastings (D, FL) would chair the House Intelligence Committee. As a former federal judge, he was impeached on corruption and perjury charges. He accepted a $150,000 bribe in exchange for a light sentence and then lied about it under oath. Hastings was convicted and removed from the bench by the Democrat-controlled Senate, but they declined to forbid him to ever hold office again. He was reborn as a U.S. Representative. This election is not just about voting for our local District candidates. It is also about who will be in control of the House, our troops, our money, and our security. Berry, Snyder and Ross have proven over and over that they will not go against this liberal crowd and vote to represent the majority values of Arkansas voters. It?s time to elect others who will represent the values of Arkansans and to keep the House leadership from falling into the hands of extreme liberals. Page 1: Release previously saved scandalous material to the media wing of the Democratic party. Page 2: Exaggerate facts to make it look like more Republicans are involved than actually are. Page 3: Claim it's a Republican conspiracy and cover-up of major proportions. Page 4: Call for Congressional hearings and/or investigations. Page 5: Try to involve Republican leadership figures in the Conspiracy whenever possible. Page 6: Call for Republican leaders to resign (evidence of involvement isn't important). Page 7: Conduct loaded media polls and report on them to show that Americans are turning against Republicans. Page 8: Make the pre-planned poll results the headline story in the media and on the front page of the New York Times and Washington Post. Page 9: Whenever possible, try to involve the President and his administration in the scandal. Page 10: Continue the propaganda attacks and repeat the cycle (1 through 9) until election day. When asked about Mark Foley, the ARRA editorial staff says "good riddance to this RINO." We would that all people who practice immorality and forms of perversion would absent themselves from the Republican Party. We appreciate Speaker of the House Dennis Hastert telling Foley that if he did not resign, then the republican congressmen and women would demand his removal from Congress. As identified in our masthead, the ARRA is the home of social, moral, and fiscal Conservative Arkansans who believe in God, family, and country and are working together to strengthen both the Arkansas and National Republican Party by upholding the traditional, Republican ideals. We cannot abide RINOs. We pray that fellow conservative family values voters will not be discouraged but encourage to go to the polls and vote for our pro-life, pro-family values candidates in November. To not do so would be to vote for people who do not uphold your values and to give into the "shark-feeding frenzy" of the press and news agencies. We pray for God's wisdom for our leaders and for voters.